What's in Madeca's Sisig Burrito? 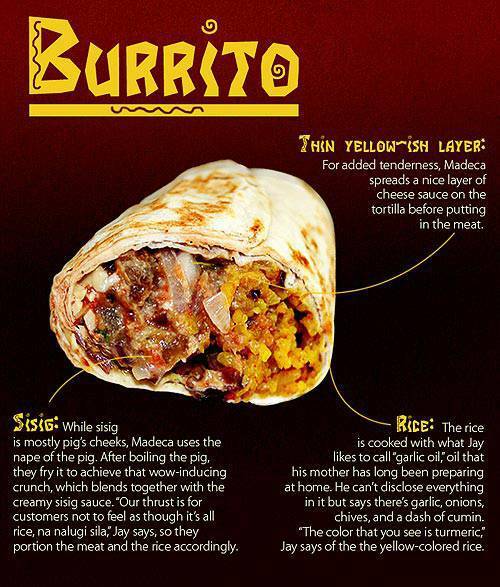 What’s in Madeca’s Sisig Burrito? Because sometimes, we need to know where the magic is coming from. 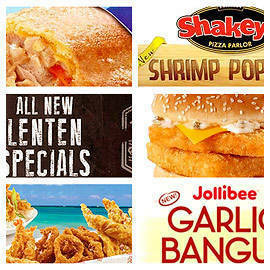 (SPOT.ph) Since it opened in November 2012, Madeca has constantly been appearing in our social media news feed. We’ve read about their fish tacos on FB, we’ve seen pictures of their very photogenic drinks on IG (we’re crazy about their striped straws and dalandan mojito). 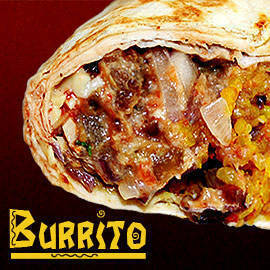 While their salpicao burrito made it to our Top 10 Burritos list (it’s number 4, baby! ), it must be said: this Fil-Mex eatery’s sisig burrito cannot be ignored. "The very first Fil-Mex item we had was the lechon kawali," says Miguel Vea, one of the seven guys behind Madeca. "Then we thought, luto nga tayo ng sisig, tapos isalpak natin sa burrito," continues Jay Pronstroller, whose mother became a huge inspiration for the restaurant. It was the food she served every time her boys had friends over that sparked many a "what if we put up a restaurant" conversation over beers. It took them all of one try to know that the sisig burrito would make it to Madeca’s menu. And it took us all of one bite to launch a long conversation about what could be in this thing of beauty. While the ratio of meat to rice is 1:2, Madeca’s thrust is for customers not to feel as though rice is all they are eating. The magic, we deduced as we chewed, must lie in the meat. 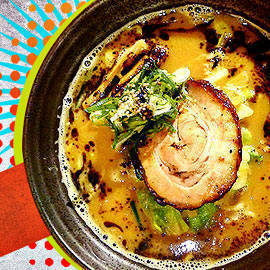 We asked team Madeca, which means Manila de Acapulco, by the way, about their creation. Below is an illustrated explanation.